My World GIS project map of Greenland with Ice Sheet and Glacier Velocity Data on the map. A visualization of the Greenland Ice Sheet thickness and the regions of fastest glacial movement across the continent. This chapter is appropriate for students in grades 7-14.
use analyze mode to complete subtraction of layers and fields to calculate net change. This chapter offers the opportunity to make connections between an observable change in the cryosphere and its potential impact in the hydrosphere and atmosphere. As such, it provides a model for system-level exploration and inquiry, following the observed results of changes in one sphere to their consequence in other spheres. NASA Earth Observatory (EOS) image of the day Northwest Greenland Canyonsincludes a picture of northwestern Greenland and describes the role of the IceBridge project in monitoring the ice sheet. NASA Earth Observatory (EOS) feature story, August 28th, 2007 Greenland's Ice Island Alarmdescribes NASA's role in the research. NASA Earth Observatory Vanishing Icearticle has excellent description of research. Steffen Research Group Melting Glaciers and Ice Sheetsarticle describes how glaciers contribute to global sea-level rise. Students who use this lesson will need to be familiar with the following key terms. The National Snow and Ice Data Center (NSIDC) hosts an excellent primer on glaciers (All About Glaciers) for students who are new to the cryosphere. Other important terms listed below can be can be found in the NSIDC Glacier Glossary. Introduce the mystery: What impacts has global warming had on the Greenland Ice Sheet? As a whole class, begin with an open-ended discussion about the following questions and others you deem necessary to set the stage. Do not feel the need to answer all of the students questions at this point as these questions are meant to pique the interest of the students before the lesson. Adjust these questions based on the background knowledge and level of your students. How and why do we study climate? Why is there an ice cap in Greenland? Has the ice cap always been there? What might be the signs of the ice sheet/cap melting? What are be some signs (fingerprints) of climate change? What might be the signals of climate change in the ocean? In order to engage students in the excitement about Greenland's changing ice sheet and the potential impacts, choose one or more of the introductory options listed below. Show the video from NOVA, Science Now: Fastest Glacier or Scientific American Frontiers XV: Hot Planet - Cold Comfort. Both videos are available online and can be shared via a computer. Alternatively, print and have students read a recent news article on Greenland melting. Several sources are listed in the Background Information and Other Resources sections, on this page. Demonstrate how to open the My World project file. Allow students to work through the lesson at their own pace. They will discover the tools as they work though the lesson. Advanced students may be able to invent their own methods for solving the questions. If you are using this project file with multiple students, either remind students not to save changes when they quit the program, or have them rename the file when they save, so that they do not overwrite the original project file. This chapter engages students in the measurement and analysis of the melting of the Greenland Ice Sheet. From this starting point students may decide to investigate the causes and/or consequences of this melting. This lesson is well suited for students in AP Environmental Science or Earth Science classes. It can also be used as an introduction to remote sensing or glaciology. The use of tools and techniques, including mathematics, will be guided by the question asked and the investigations students design. The use of computers for the collection, summary, and display of evidence is part of this standard. Students should be able to access, gather, store, retrieve, and organize data, using hardware and software designed for these purposes. Thinking critically about evidence includes deciding what evidence should be used and accounting for anomalous data. Specifically, students should be able to review data from a simple experiment, summarize the data, and form a logical argument about the cause-and-effect relationships in the experiment. Students should begin to state some explanations in terms of the relationship between two or more variables. With practice, students should become competent at communicating experimental methods, following instructions, describing observations, summarizing the results of other groups, and telling other students about investigations and explanations. Women and men of various social and ethnic backgroundsand with diverse interests, talents, qualities, and motivationsengage in the activities of science, engineering, and related fields such as the health professions. Some scientists work in teams, and some work alone, but all communicate extensively with others. New techniques and tools provide new evidence to guide inquiry and new methods to gather data, thereby contributing to the advance of science. The accuracy and precision of the data, and therefore the quality of the exploration, depends on the technology used. Technology productivity tools. Students use technology tools to enhance learning, increase productivity, and promote creativity. Technology problem-solving and decision-making tools. Students use technology resources for solving problems and making informed decisions. Three to five 45-minute periods will be needed to fully complete the case study and all exercises. Times will vary depending on prior knowledge and skills. Steffen Research Groupsite contains additional information about this research project. Alley, R. B. (2002). The Two Mile Ice Time Machine. Princeton NJ: Princeton University Press. Angier, J. (2005). Hot Planet - Cold Comfort. On Scientific American Frontiers [VHS]: PBS. Kolbert, E, (2005) The Climate of Man - Part I, New Yorker Magazine. Kolbert, E. (2006). Field Notes from a Catastrophe. New York: Bloomsbury Publishing. Steffen, K., Huff R., & Nuemann, G. (2004). 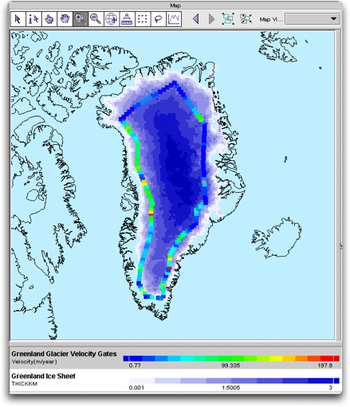 The melt anomaly of 2002 on the Greenland ice sheet from active and passive microwave satellite observations. Geophysical Research Letters, 31. Handouts and additional materials for this lesson are listed below. Greenland melt extent 1992 - 2003 (Excel 30kB Jan12 09)completed Excel file (optional graphing activity).